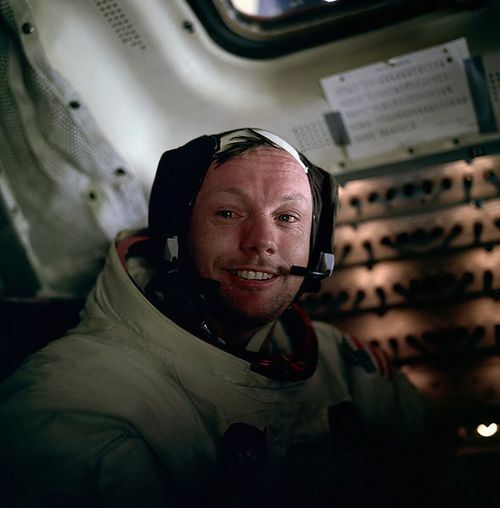 It is possible, in one sense, to overstate the importance of Neil Armstrong. He was not responsible for the initiative to land people on the Moon, for which he became a figurehead. It would have happened without him, probably on the same day. But nonetheless it was he who became, to my mind, the single most important person in human history. It is impossible to overstate the meaning of that event, forty-three years ago. That second when he descended the ladder to plant his feet on the powdery soil of the Moon is for me the single most significant moment not only in the story of our species but in the timeline of our planet. He was humble, clever and articulate. I can’t imagine the courage it must take to be prepared to live out of a fragile box on a world with no atmosphere, 240,000 miles from Earth. President Nixon had already had a speech prepared, to be delivered in the event that the Lunar Module’s rocket motor failed, stranding Aldrin and Armstrong on the Moon. Chillingly, it was intended to be delivered while they were still alive, but doomed. For as long as humanity persists, his name will be remembered.